Fidelia Bridges (May 19, either 1834 or 1835–1923) was one of the minute population of successful female artists in the 19th century and early 20th century. 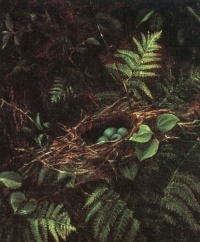 She painted small aspects of nature: flowers, birds, and other plants in their natural settings. She first was an oil painter and later took up watercolor painting. She was known for her delicately detailed paintings. She was considered an expert and specialist in watercolor painting. She was the only woman of six men in the group of notable 19th century artists in the American Watercolor Society. Unless indicated otherwise, the text in this article is either based on Wikipedia article "Fidelia Bridges" or another language Wikipedia page thereof used under the terms of the GNU Free Documentation License; or on original research by Jahsonic and friends. See Art and Popular Culture's copyright notice. This page was last modified 19:06, 12 June 2014.